New Delhi: Leaders from the UK and India involved in developing new academic and business relations will meet at the Indian High Commission today to examine post-Brexit opportunities. 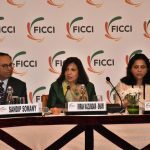 The roundtable session – ‘A New Interdependence: activating a new diplomacy between India and the UK’ – is convened jointly by the University of East Anglia (UEA) and the Federation of Indian Chambers of Commerce & Industry (FICCI). Mr Shailesh Vara MP and Dr Daniel Rycroft, Chair of the India Dialogue (UEA), will coordinate the session that inaugurates UEA’s [email protected] programme. Marking seven decades of the India-UK relationship and the current significance of the India-UK strategic partnership, it is envisaged that the programme will bring about new opportunities for engagement between business, academic, civil society and diplomacy partners. UEA’s programme complements existing activities, such as the India-UK Year of Culture and FICCI’s new Forum of Parliamentarians. Dr Rycroft said the key objective of the inaugural session is to consider why the advocacy of ‘democracy, liberalism and a rules-based international order’ matters to each nation and to the wider world now. Discussions on Monday will involve members of the High Commission of India, the Foreign and Commonwealth Office (FCO), UK Parliamentarians, scholars and business leaders. Mr Yashvardhan Kumar Sinha, High Commissioner of India to the UK, will deliver the keynote address that will set the tone for panels on the India-UK strategic partnership, on business diplomacy and on academic diplomacy. India’s former Ambassador to the United Nations, Mr Asoke Mukerji, will inaugurate the session that also involves the United Nations Association (UK). Dr Rycroft, a Senior Lecturer at UEA, said: “The future of the India-UK relationship has rarely been as important as it is now. “The current political climate is making people from many different sectors realise the long-term value of diplomacy, which doesn’t always have to operate on strictly a government-to-government basis. There’s capacity for the business and academic communities to complement these important discussions. Mr Richard Everitt, Head of Education and Society at the British Council, India said that UEA’s [email protected] initiative will help to define “a milestone year, and one that we are celebrating with a range of events to support the India-UK Year of Culture”.